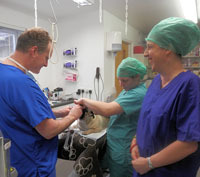 Our veterinary surgeons have extensive surgical experience, and our facilities and standards are top quality. We perform all standard and emergency surgery right here at our clinic. Therefore your pet is always in our care and is kept safe and comfortable at all times, which minimises their stress. 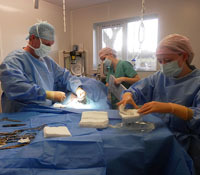 Many vets now use factory-style operating theatres where pets are transported along with others in the back of van. They travel significant distances to a central "processing clinic". We think this is a terrible approach because it causes a great deal of stress on pets. For pets under our care, they stay at our clinic. We are exceptionally careful to make things as smooth and painless as possible - both for you and for your pet, 24 hours a day. Surgery is generally divided into soft tissue surgery and orthopaedic surgery. Soft tissue surgeries encompass neutering and tissue repairs. Orthopaedic surgeries focus on bones, tendons, and joints. In some complex surgical cases, if your pet needs a procedure requiring specialised equipment or expertise, we provide you with a referral to a respected practitioner. Neutering your pet is a kind way to help them live a long, healthy life. Neutering prevents unwanted pregnancies, decreases marking, roaming and dominance behaviour, and can even dramatically decrease the risk of some types of cancer. Client invited to watch. Anyone present in theatre wears scrubs. To reduce the risk associated with anaesthesia, we do a thorough physical examination and blood work prior to surgery. 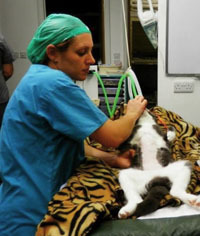 We administer a general anaesthetic to the pet before surgery. This results in a loss of consciousness and a loss of sensation throughout the body so that the pet is pain-free throughout the procedure. Keeping your pet in a pain free condition is foremost in our mind and we never take short cuts or cost cutting approaches. We have top quality modern surgical equipment and stringent surgical procedures. 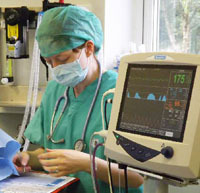 During surgery, the pet is always connected to monitoring equipment. We ensure high standards by focusing on careful preparation and continuous monitoring of vital signs for the safety and pain free comfort of your pet. We use top quality equipment including a special Advisor Surgivet Monitor for monitoring pets under general anaesthesia. This equipmentsurgery monitoring equipment monitors ECG, CO2, oxygen, blood pressure, heart rate, respiratory rate, and temperature. Our infusion pump administers intravenous fluids at a controlled rate. 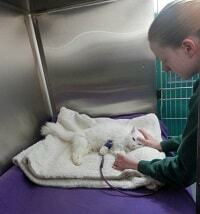 Your pet's statistics are charted from the moment your pet is anaesthetised to the time when he or she wakes up. Your pet's comfort is important to us. 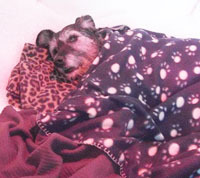 Your pet is placed on a heating pad, veterinary bedding, and incontinence pad to keep them warm and comfortable. This helps maintain normal body temperature and speeds up the recovery from anaesthesia. Your pet is constantly monitored to ensure they do not feel any pain during the procedure. Tranquillisation or sedation is used to calm an animal under various conditions. The animal remains awake or may ‘sleep' but is easily aroused when stimulated. Pet owners sometimes request sedation for their animals during travel, severe thunderstorms, fireworks, etc. Sedation and Tranquillisation are not without risk and each animal will be assessed by us prior to dispensing these medicines to determine if it's safe for your pet. The care and comfort of your pet during recovery is so important and we guarantee you will not find in-house care that matches what we do for your pet. We take pride in the extra effort we make to ensure their environment is as nurturing and calming as possible. We always use pain medication to keep your pet comfortable while they recover and it will be dispensed for you to continue administering while he or she heals. 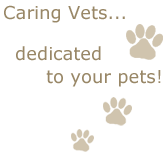 Please see facilities for a look at the kennel areas and our in-house care. Taking a pet home after surgery or treatment can be a worrysome time for owners as they care for their pet during recovery. We sincerely understand the stress you feel, and at any time day or night we are just a phone call away. We welcome you to come by for a behind the scenes tour. We would be delighted to have you visit us soon and meet our caring team!